If you scrolled through the Instagram feed of 19-year-old Maddy Holleran, you would see a perfect life: a freshman at an Ivy League school, recruited for the track team, who was also beautiful, popular, and fiercely intelligent. This was a girl who succeeded at everything she tried, and who was only getting started. But when Maddy began her long-awaited college career, her parents noticed something changed. Previously indefatigable Maddy became withdrawn, and her thoughts centered on how she could change her life. In spite of thousands of hours of practice and study, she contemplated transferring from the school that had once been her dream. When Maddy's dad, Jim, dropped her off for the first day of spring semester, she held him a second longer than usual. That would be the last time Jim would see his daughter. 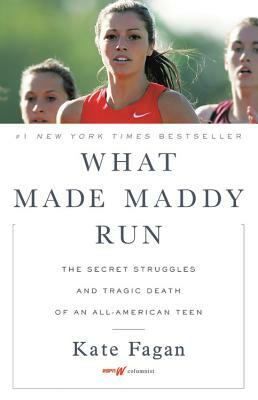 WHAT MADE MADDY RUN began as a piece that Kate Fagan, a columnist for espnW, wrote about Maddy's life. What started as a profile of a successful young athlete whose life ended in suicide became so much larger when Fagan started to hear from other college athletes also struggling with mental illness. This is the story of Maddy Holleran's life, and her struggle with depression, which also reveals the mounting pressures young people, and college athletes in particular, face to be perfect, especially in an age of relentless connectivity and social media saturation. Kate Fagan is a columnist and feature writer for espnW, ESPN.com and ESPN The Magazine. She is also a regular panelist on ESPN's Around the Horn and can also be seen on Outside the Lines, First Take and His & Hers. Previously, Fagan spent three seasons covering the 76ers for the Philadelphia Inquirer. She is the author of a memoir, The Reappearing Act, and co-host of the espnW podcast, Free Cookies. Kate lives in Brooklyn, New York with her girlfriend Kathryn Budig, and their two dogs. "Holleran seems so alive on the page; her messages and Fagan's prose create someone who seems a real, living thing, so much so that by the end, this reader was rooting for her to talk to someone"
"A provocative and thoughtful look at a student-athlete suicide that rocked the nation--but didn't, until now, actually help inform the nation. A labor of love and prevention by Kate Fagan, and Maddy's family and friends."